As Myanmar prepares to hold its first actual electoral contest in a quarter-century Sunday, hope mingles with anxiety on the streets of the country’s largest city. “I think there may be a bit of cheating during the balloting because the military hand-picked the election commission members. But I don’t think it’ll be too egregious,” predicted taxi driver Maung Maung Than. With the increasing political assertiveness of ultra-nationalist organizations in the Buddhist-majority nation, “there are a lot of concerns about potential flash points, including places where Muslims will be voting,” Phil Robertson of Human Rights Watch Asia told VOA. Opposition leader Aung San Suu Kyi and her party scored a resounding victory in 1990's election, but the generals ruling the country at the time prevented the NLD from taking power. The National League for Democracy is expected to do well again this time against its main foe, the governing Union Solidarity and Development Party, which has powerful backing from the army. A law drafted under the former military junta states that no president can have a spouse or children with foreign nationality. The clause in the 2008 charter was written with Suu Kyi in mind, since her late husband was British. Despite that legal prohibition, she vows to be the one in charge of the government if the NLD prevails on election day. “I have said, if we win and the NLD forms a government, I will be above the president. It's a very simple message,” Suu Kyi told a news conference Thursday in Yangon. Suu Kyi describes the electoral process as riddled with irregularities and already is calling into question its credibility. Even before the election is held the process is fundamentally flawed in key ways, according to Robertson, who is deputy director of HRW's Asia division. He cited “bias at the Union Election Commission, a lack of independence for any appeals process, and favoritism in the state media," which he said have been "overly laudatory toward the USDP," and have hardly mentioned any other parties." 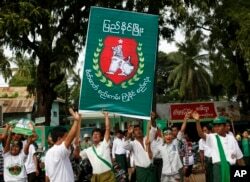 Supporters of military-backed Union Solidarity and Development Party (USDP) dance in front of a regional office during a campaign rally for the upcoming general election in Meiktila, Mandalay Region, Myanmar, Nov. 4, 2015. The state election commission UEC promised unhindered access to polling stations for more than a thousand accredited election observers, including international monitors. “If we try to go to places and we’re not allowed, whether it’s a military base or some other polling station, then yes, we will definitely mention that in our reporting,” said Jonathan Stonestreet, associate director of the democracy project at the Carter Center. The Muslim Rohingya of Rakhine state, as well as ethnic Chinese and Indians who have lived in Burma for many generations are among the disenfranchised. The UEC also said voting will also not take place in many townships and villages in Shan state, where “the situation is not conducive to free and fair elections,” due to continuing armed conflict between government forces and ethnic rebels. In all, an estimated one-fifth of the potential electorate has been deemed ineligible to vote for various reasons. And the military – regardless of the performance of the governing party it backs – will retain substantial power. One-fourth of all parliamentary seats are reserved for military officers.